I have vivid memories waking up when I was a kid to the smell of turkey roasting on Thanksgiving morning. Our clan would arrive to my folks house around lunchtime and we would begin enjoying several delicious Vietnamese dishes, courtesy of mom and the aunties. While waiting for the turkey, we would watch movies, play games, snack, and catch up with the latest gossip. We would then feast again once the turkey came out of the oven—a turkey with Asian flavors that Mom created with five-spice and tons of garlic. To this day, Mom’s turkey is still the juiciest and most flavorful I’ve ever had. After the turkey and sides were devoured, we would continue with the chatting and games. And hours later, believe it or not, the family would have one last meal. Usually Cháo (Vietnamese rice porridge) or Bún Bò Huế (Spicy Beef Noodle Soup)–something warm and comforting to close out the night. Needless to say, it was among my favorite times of the year. Not just because of the incredible food (and trust me, it was incredible) but because of the memories that surrounded these feasts. 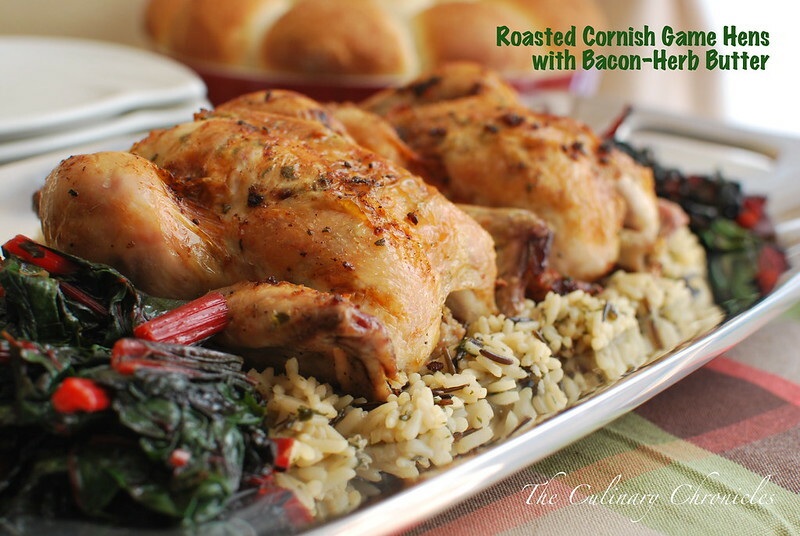 But if prepping a turkey appears too daunting for you, opt for roasting a chicken or a few Cornish game hens. Either will provide a succulent alternative and can be roasted in a fraction of the time. And because I subscribe to the belief that bacon makes EVERYTHING better, try out this compound butter filled with fresh herbs and smoked bacon I used on game hens I made for dinner for some friends. 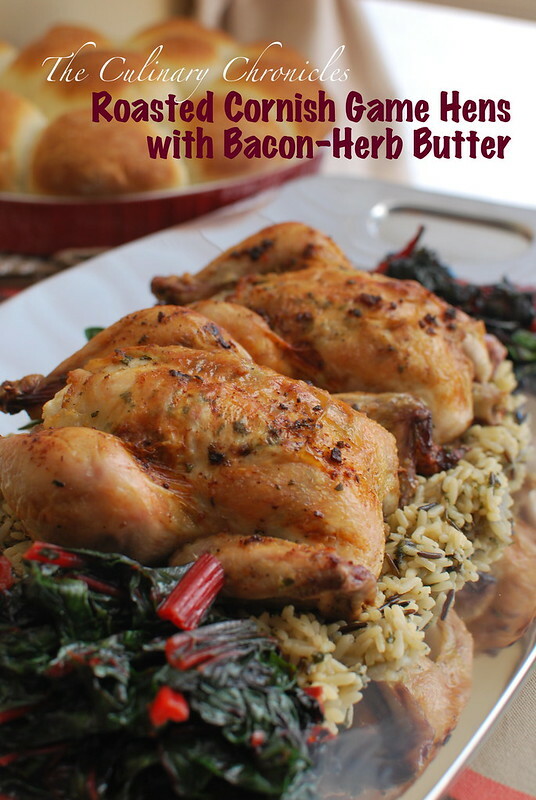 The smokiness from the bacon and bright herbs were wonderful with the hens. With that Friends, stay tuned for Wednesday’s post as I share a scrumptious and easy dessert that could be appreciated at any Thanksgiving feast. And because I love y’all, I’ll be announcing a gorgeous giveaway, too. True Story! Happy Monday and here’s to a short work week! Yippee!!! In a food processor, pulse together the butter, bacon, and herbs until combined. Season the mixture with ½ teaspoon kosher salt and ½ teaspoon of black pepper. Take each hen and slide your fingers between the skin and breast meat to loosen. Be careful not to tear the skin. Gently rub 2-3 tablespoons of the butter mixture underneath the skin. Inside the cavity, heavily salt and pepper the hen. Stuff the cavity with the remaining butter mixture and quartered onion. Rub the exterior of the hens with olive oil and generously season with kosher salt and black pepper. Truss the hens with kitchen twine. Place the hens on a large, rimmed baking sheet or shallow roasting pan. Rotating the pan halfway through cooking, roast the hens until a thermometer inserted into thickest part of the thigh registers 170 degrees–about 45-50 minutes. Carefully remove the hens and rest on a cutting board. Loosely tent with aluminum foil and allow hens to rest for 10-15 minutes before serving.